I am pleased to announce the release of AJDT 2.1.1. In this release, we have focussed on AspectJ-aware searching and refactoring. This release also includes AspectJ 1.6.10. Please see the New & Noteworthy for more details, including a list of refactorings that are currently known to work in AspectJ files. I've had a few requests for the source code for the Groovy-Eclipse integration for maven, as well as a sample project that uses it. 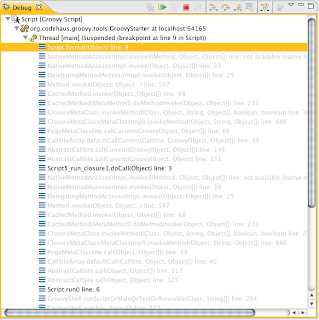 You can get both the sample project and groovy-eclipse compiler plugin for maven. They are packaged as two m2eclipse projects, and it is recommended (although not necessary) to import them into Eclipse to use them. 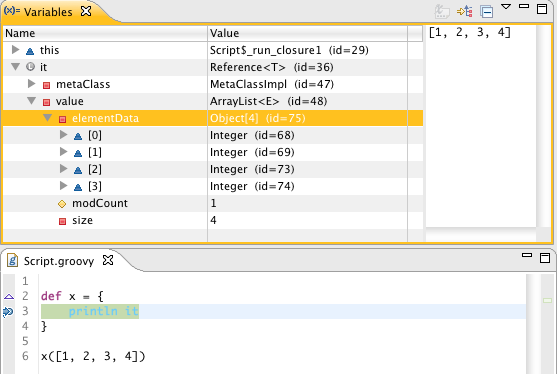 The groovy-eclipse-compiler project contains the compiler integration. It is a single Java class that calls into the Groovy-enhanced JDT compiler. This maven plugin uses plexus to hook into maven's compiler plugin. 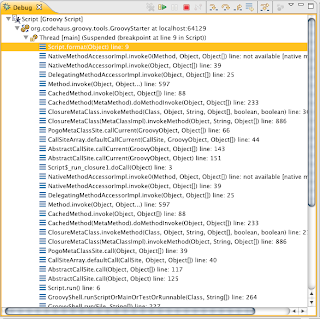 The groovy-eclipse-maven-tests project is a very simple maven project that has a few Groovy and Java classes that interact with each other. If you want to create your own project using the Groovy-Eclipse maven integration, I would recommend starting with this sample project. A short while ago, I wrote about the new debug support for GSP files inside the SpringSource Tool Suite. 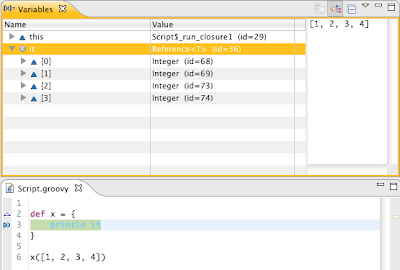 What I didn't describe is that this has coincided with enhanced debug support in Groovy-Eclipse. 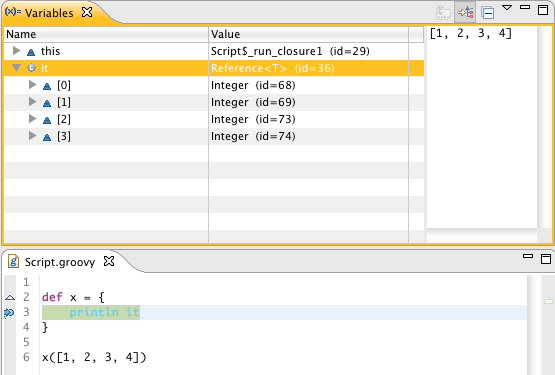 There are a few tricks that you can do inside of Eclipse to vastly improve your debugging experience. Much of this is now automatically configured for you when you install the latest snapshot of Groovy-Eclipse, available at this update site: http://dist.codehaus.org/groovy/distributions/greclipse/snapshot/e3.6/. 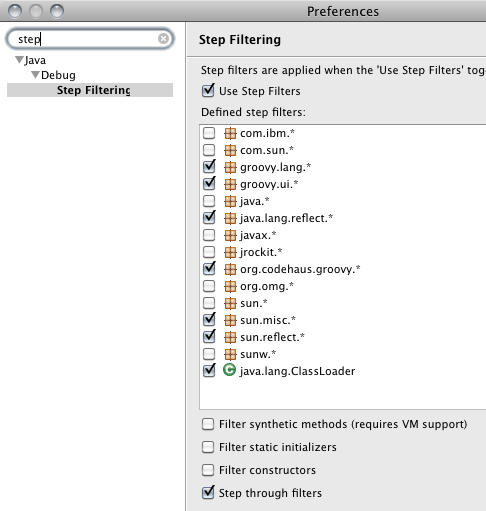 The Eclipse Java Development Tools supports the concept of step filters that enable a user to specify regular expressions of type names that should be ignored by the debugger. By this I mean that using any of the step commands (step into, step over, step out of...), the debugger falls through any types that match a filter. This is particularly useful for stepping through Groovy MOP stack frames, including most stack frames that start org.codehaus.groovy. *, and many of the sun.reflect. * frames as well. Note that it is still possible to stop at a breakpoint set inside of a filtered type, but the next step-* command will step through to the first unfiltered type. Unfortunately as you can see, you have to dig 3 levels deep to see the contents of the list. This feature, combined with step filtering above makes stepping through Groovy code significantly more efficient. Two of the most requested debugging features are Groovy-aware hotswapping (so that Groovy code can be edited, compiled, and loaded without needing to restart a debugging session) and a Groovy-aware Display view (so that Groovy snippets can be executed in the context of a paused application). We've had some success with hotswapping, but more work needs to be done before it can be generally useful. Specifically, we've hit some limitations due to the class files produced by groovyc and are awaiting a fix for GROOVY-4152. A Groovy-aware display view is something that we need to work on and I hope to have initial support for this for the 2.1.0 release in late October. Clearly, we have work to do, but the existing debug support provides significant improvements over what was available even a few months ago. Where are all my stubs? Update: you must also include a pluginRepositories section. See below for XML snippet. Update: See here for a sample project and the source code of the compiler integration. Although this works reasonably well in many situations, there are some complications and problems with this approach, most of which have already been described recently in detail on the groovy-dev mailing list here and here, so I won't go into them in this post. About a year ago, we introduced Groovy-Eclipse 2.0, which compiles Groovy code by plugging into the JDT compiler and does not need to generate stub files. And as Andy Clement describes, it is possible to run the compiler in batch mode on the command line. And now, with a little bit of glue code required, I have released a snapshot of the compiler with both ant and maven integration. Although, this is still early work, I do hope that this approach will solve many of the problems that Groovy programmers are having with stub generation. I'll describe below how they both work. Ant integration for the batch compiler is fairly simple. Download the groovy-eclipse-batch-0.5.0.jar from its temporary location. Add this jar to your ~/.ant/lib directory. Once you have that, you need to set the build.compiler property to org.codehaus.groovy.eclipse.ant.GroovyCompilerAdapter. This will cause ant's javac task to delegate the Groovy-Eclipse compiler for the actual compilation. This means that it is possible to pass any combination of Groovy and Java files to the compiler and most parameters applicable for javac are still available when using the compiler adapter. This script sets compiler adapter and compiles all source files in src, placing the resulting class files in bin. Both *.java files and *.groovy files are included in the compilation. 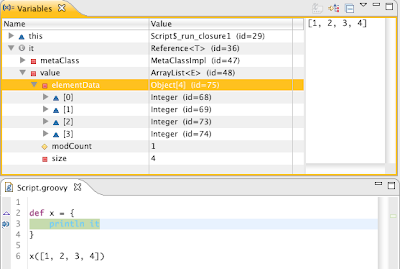 Groovy-Eclipse can now also be used from maven. To do so, add the following to your pom.xml. Since stubs are not generated, GroovyDoc and any other artifacts that rely on stubs cannot be generated. This only supports Groovy 1.7. Third (ant only), your project must have at least one Java file in it (this can be an empty stub), or else ant will finish without compiling anything. There is a patch for this (Bug 48829), but I am waiting for it to be contributed back to ant. There is still some work to be done, but it is ready enough for people to start trying it out. Feedback is greatly appreciated. You can reply to this blog post, send a message to the mailing list, or raise an issue on jira. This is the line mapping information and each element of the lines array maps a line from the translation (the array index) to a line in the original source code (the value at that index). This is not particularly useful to humans, but it is to the SpringSource Tool Suite. This feature has been fun to implement since it was my first foray into Eclipse's Java debug interface, but I am not sure how useful it is going to be. Lines in a GSP are not executed sequentially. Rather, many are executed out of order through closures inside of an invokeTag method call. Also, I have not completely worked out how to determine if a breakpoint is at a valid location if Grails is not already running. So, at this point it is possible to set a breakpoint on any blank line, but these breakpoints are only valid if they are set on a line containing a GSP tag or some other kinds of things. But, I do hope this is useful to you and if you are interested in trying this new feature out, then you can download STS 2.5.0M3 and install the latest version of Grails tool support. Enjoy! Up until recently, doing any PDE work with Groovy has been a bit of a kludge. First, you had to create a customCallBack.xml script. Inside this script you had to call out to a special groovy.jdtcompile ant task, using a magic set of classpath references. When this approach worked, it did so by first compiling your Java code (with errors of course since your groovy code is not touched), and then re-compiling all your code using the joint compiler provided by Groovy-Eclipse. Not so pretty. It works for Groovy-Eclipse, but that is only because I know exactly what its limitations are and how to work around them. A short while ago, I wrote about how we re-implemented PDE build for projects that use the AspectJ compiler. I've recently done the same for plugin projects that use Groovy. Install the latest dev snapshot of Groovy-Eclipse for Helios (you can write plugins that target Galileo (Eclipse 3.5), but you must use the Helios PDE builder to create the plugins). compilerAdapter.useLog=true  # this ensures that exceptions are logged to the proper log file. Now you can run your PDE export (either headless or from within a running Eclipse using one of the Export wizards). The only caveat is that each plugin project must contain at least one .java file or else the PDE builder will ignore that plugin. The problem is described in Bug 318951. Before this can be addressed, I need a patch committed to the javac task, described here: Apache Bug 48829 (please vote the bug up if you want to see this fixed!). 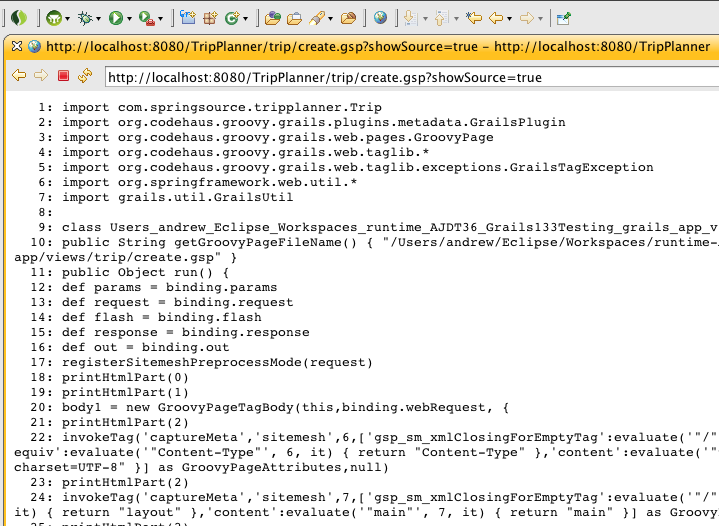 With that, creating Groovy-based Eclipse plugins now requires much, much less black magic. Last night, 31 Eclipse developers from the Vancouver, BC area met up, listened to a few great talks, went for some beers, and had a great time. We had 8 speakers who surprisingly all stayed within their allotted time of 8 minutes (maybe it was a threat of a nerf gun that did it...I don't know). The pace was brisk and we heard lots of good things from lots of great developers from around Vancouver. This year's Demo camp was sponsored by the Eclipse Foundation, SpringSource (a division of VMWare), and TaskTop. Mik Kersten started the evening off with a brief introduction to some new features in the new Helios release. In addition to modernizing SWT to integrate better with Windows 7, and new Mylyn connectors, the most interesting new feature he described was the Eclipse Market Place. In the past, finding new content to install into your Eclipse installation required users to go to an external browser, find a link to an update site, and copy it into your update manager. Now, all this can be done transparently through the market place client from within Eclipse. Next up was Kris De Volder, a new colleague of mine that we snatched from the Computer Science Department at the University of British Columbia (UBC). He demoed some of his new work on AJDT, specifically the new Pull-Out refactoring that allows users to pull-out fields and methods from classes and convert them into intertype declarations. This will be available in the upcoming 2.1.0 release of AJDT. He also demoed the Push-In refactoring, the converse of Pull-Out, which takes existing intertype declarations and pushes them into their target types. This is work that I did a short while ago and is described here. Emerson showcased some of his research at UBC on how Eclipse is being used, or not used by developers. Some of the most surprising results of his research, in my opinion, are how little all of the various refactorings are used inside of Eclipse. And how the ones that are popular are not the ones that I personally use. My personal favorites are rename (field, method, type, etc), extract (local, constant, and method), and convert local variable to field. Apparently, not many people use the last one. But (oddly, in my opinion), inline method seems to be quite popular---something I've never used. David gave a brief tour of MuleIDE, which provides tool support for creating and managing your MuleSoft projects in Eclipse. David used MuleIDE to access road work data from the city of Vancouver and built a simple application to determine how many kilometers of roadwork are currently underway in Vancouver. Not bad for 8 minutes! Do you use the "Show annotations" feature of CVS or SVN? I actually didn't know about this. Using "Show anotations" will add gutter markers on lines changed by recent commits to the source repository. Hovering over the annotations will provide extra information. Alex showed his enhancements to the Java editor, which converted these annotations into semi-transparent overlays that co-exist with the source code. This is work that Alex has done for his master's thesis at UBC. I liked how his enhancements made version changes more explicit in the editor. Nieraj is another new colleague of mine at SpringSource. He's a summer student from the University of Victoria. 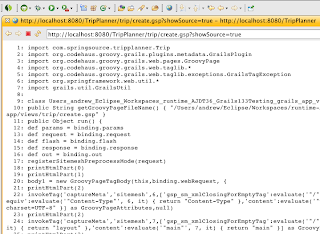 Nieraj showed his recent enhancements of Grails support in the SpringSource Tool Suite. He showed the Grails explorer view, which allows developers to view their Grails projects organized in a way that emphasizes artifacts and structure specific to Grails projects. 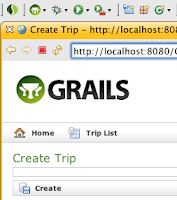 He also showed his work on the Grails Plugin Manager, which allows developers to view, install, update, and uninstall Grails plugins into their projects. Luke introduced the CAL programming language, a lazy-functional language developed by him and others when he worked at Business Objects (now SAP). He showed how programmers can use CAL to quickly and easily compose functions to manipulate streams of data in complex ways. It is this language that forms the core of the business reporting tool produced by his company, Indicee. Finally, Bjorn showed ProjectKoach, an RCP application that brings agile planning into Eclipse. He showed how you can create sprints, manage tasks, integrate with version control, and integrate with bug trackers through Mylyn. I was pulling my hair out trying to figure out why all four builds would be failing in the same exact way even though they span Eclipse versions (Galileo and Helios), and servers. All links I could track down seemed to imply that the root cause are SWT resources that are not properly disposed. It turns out that solution was a bit more banal than that. There were no leaks in my code. Instead, this exception occurred because there was no virtual display available on the build servers for running the UI tests. Xvfb had shut down. After a restart of Xvfb, the tests are now running as expected. Now, why Xvfb would happen to shut down on both servers at the same time still befuddles me, but the problem is fixed. I just hope that the next person who sees this problem doesn't also immediately think there is a resource leak, and pull their hair out to find it. And then point your p2 installer to the downloaded archive. 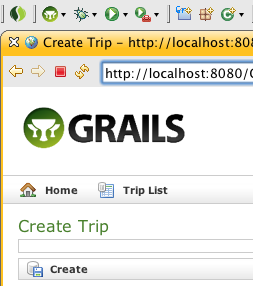 You will then be able to install Groovy-Eclipse. We have only tested on 3.6 M6 and we will continue to ensure that it works on later milestones as they come out. As always, your feedback is appreciated! AspectJ-aware PDE builds in AJDT have always been a bit of a kludge. So, I'm happy to say that as of Eclipse 3.6 (Helios), things will be changing for the better and AJDT will rely on a different mechanism to perform PDE builds. PDE, or the Plugin Development Environment, is the tool set that helps developers build plugins for the Eclipse platform itself. In Eclipse 3.5 and earlier, AJDT shipped with its own version of the PDE tools (AJDT-PDE) that were largely a copy of Eclipse's PDE, but with a few key changes so that a different compiler could be plugged in. It is an understatement to say that this was inefficient. The AJDT-PDE had to be re-created for each point release of Eclipse so that it could be re-based off of the new version of PDE. This process was fallible and inevitably, some features of PDE were missing or broken in AJDT-PDE. The first line specifies that the AspectJ compiler should be used instead of the Java compiler. The second line specifies what file types should be considered source files. And optionally, you can specify a number of command line arguments using the compilerArg property. Only AspectJ-specific arguments like inpath and aspectpath need to be specified here. For all standard Java options, like source and target you can use the standard PDE-Java options javacSource and javacTarget. From here, you can use the standard PDE export wizards or PDE headless build scripts to build your project. That's it. There is now nothing special needed for AspectJ-aware PDE builds. Ensure that this new compiler adapter is on the ant classpath. I recommend using a org.eclipse.ant.core.extraClasspathEntries extension point so that your plugin automatically contributes the classpath to Eclipse's ant runtime. But, you could also specify it in your global ant classpath properties page. In your build.properties file, fill in the proper values for the compilerAdapter, the sourceFileExtensions, and the compilerArg properties. That's really all there is to it. For all the gory details on how this works see Bug 303960. Groovy-Eclipse 2.0.1 Released and see you at EclipseCon! We are proud to release to announce the release of Groovy-Eclipse 2.0.1. This release is primarily a service refresh of 2.0, but there are a couple of interesting new features including debug stack frame filtering and Eclipse 3.5.2 support. You can read the New and Noteworthy. This is also a good time to promote my talk at EclipseCon. I will be speaking about Groovy-Eclipse on Wednesday, March 24 at 2pm. 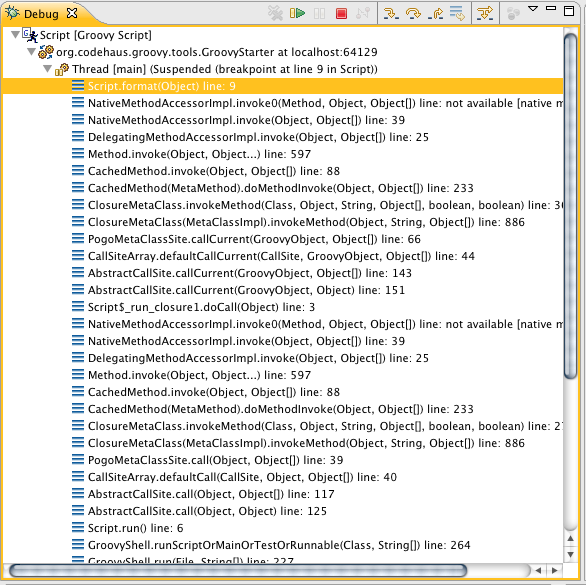 Getting Groovy with Eclipse: Next Generation Tool Support for Dynamic Languages. Come hear how Groovy-Eclipse has extended the JDT compiler to provide deep integration between Groovy and Java. Also hear about how Groovy-Eclipse provides editing support for Groovy's dynamicism through type inferencing. AspectJ-aware PDE export facilities are currently broken. I am not planning on fixing it. Instead, I have been working with the PDE team on an alternative solution. See Ability to override javac task during pde builds (Bugzilla). I'll write more about this later, but the solution is much more elegant than what is currently available in AJDT for 3.5 and earlier. Also, as a bonus, this version includes intertype declaration (ITD) -aware Java search. Finally, ITDs are completely first-class citizens in the workspace. I'll write more about this later, too. A user recently had a problem with Roo and AspectJ. This particular user had a Roo project being referenced by a regular Java project. Roo is a rapid application development tool for Java. It makes heavy use of AspectJ's Intertype Declarations (ITDs). So, all Roo projects re AspectJ projects. And here is where the problem is. When an AspectJ project makes use of ITDs, Java projects that reference it cannot reference the ITDs without errors. Well actually, the Java projects compile and run correctly, but there are spurious error messages that appear in the editor, and ITDs do not appear in content assist. Here, there are two projects, an AspectJ project and a Java project. 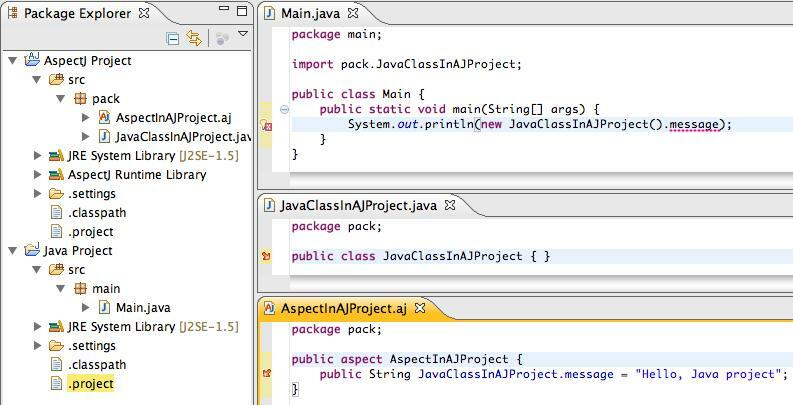 The AspectJ project has an aspect that declares an ITD on a Java class. This Java class and its ITD is then referenced in the Java project. Even though the Java project compiles and runs correctly, an error appears in the editor. In the future, I'll probably add a quick fix or some other automated way of doing this in future releases of AJDT, but for now this manual process is a reasonable workaround. As most of you who have already read my blog know, I write a lot about extending Eclipse's Java Development Tools (JDT) for use with Java-like languages such as AspectJ and Groovy. The problem, as I've mentioned before, is that while the JDT is very good at providing tool support for Java in Eclipse, it provides no support for Java-like languages. To date, I've taken two approaches to addressing this problem. Now, there is a third approach, Object Teams, that has recently made a home at Eclipse. With AJDT, the AspectJ development tools, I developed JDT Weaving. This approach uses Equinox Weaving to weave into the JDT plugins. Yes, we are eating our own dog food here and using AspectJ to implement AJDT. But, this approach has worked well for AJDT since AJDT only requires a small number of well-defined hooks into JDT to get its tight integration. For Groovy-Eclipse, our tool support for the Groovy language, the JDT Weaving approach was not feasible since we needed a larger number of hooks into JDT. And the nature of these hooks made it difficult to use AspectJ to advise them. So, instead we are using a feature patch. 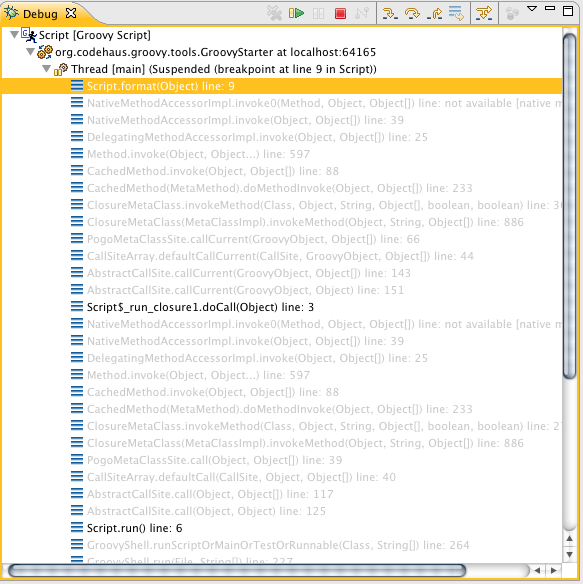 This means that Groovy-Eclipse ships its own (slightly modified and heavily tested) version of the JDT core plugin. This also means that Groovy-Eclipse needs to be re-released for each new version of JDT Core (however, this turns out not to be much of a problem since our release cycle is much shorter than JDT's). Now, Object Teams is a third approach, which I find very exciting (actually, this approach has been around for several years, but it has only recently moved to Eclipse.org). 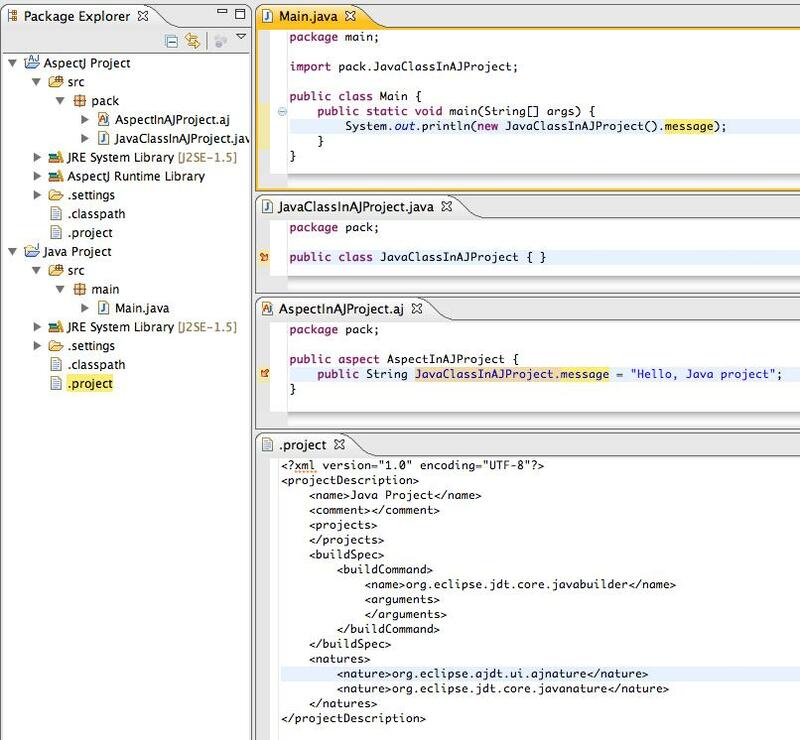 Object Teams is itself an Aspect-Oriented extension to Java, with a component, O/T Equinox, that provides integration with Eclipse's Equinox OSGi framework. O/T Equinox has been further adapted to provide easy extensibility to JDT. The O/T blog has a slick example of this approach. I'm looking forward to exploring this approach more. Although it's great that we have been able to get around JDT's shortcomings and there are multiple ways of doing this, but this proliferation of approaches is a little scary. There is no guarantee that these approaches will play nicely with each other. For a while, Eclipse installs with Groovy-Eclipse would break the Scala plugin (the Scala plugin uses a variant of JDT weaving). Although this problem has now been fixed, we need to be especially careful that a similar problem does not happen in the future. Similarly, the Object Teams tool support and Groovy-Eclipse are incompatible because they both ship with feature patches for JDT Core. Of course, the best solution would be to push our changes into JDT Core itself, we have been unsuccessful as of yet. Until then, we need open communication between all JDT hackers to make sure that we are working towards the same goal. If you're interested in learning more or have some ideas of your own, come have a chat with me at EclispeCon.